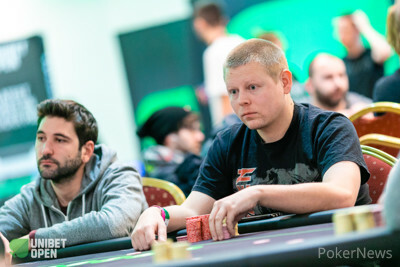 The cards were all but rushed away and Andrew Whitehouse had grabbed his belongings after being eliminated in 18th place over on the outer tables. He had three-bet all in out of the big blinds for fewer than 20 big blinds with :::As:::Qh and Keith Brennan called with the :::Jd:::Jc. The flop had brought :::Jh:::6d:::2c and a blank on the turn left Whitehouse drawing dead. All remaining 17 players are now already guaranteed €4,750.